I've had some purple sweet potatoes in my pantry for a while now. They are a little expensive, so I don't get them often, but I really love the color so sometimes I will splurge on a bag. I'm always trying to work different produce colors into our diet. I use them mostly for smoothies (just bake, peel, and you have a delicious and lovely colored smoothie ingredient). Since I am always happy to have sweet potato pancakes, I figured why not try them with the purple ones and some blackberries for extra color, flavor, and texture. Plus our twins are pretty much pancake fanatics so I knew these would be a big hit at our house (and I hope they will be at yours, too). These are another way to get your kids to eat something they may not otherwise eat and sneak in some extra nutrition. 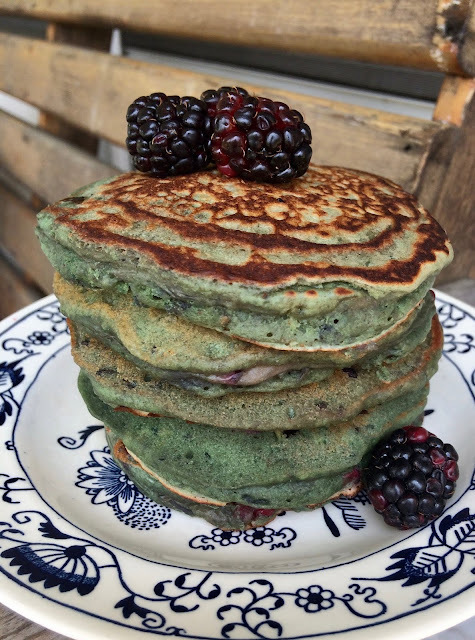 Fun fact, when you cut up the blackberries and add them to the batter, they will start to turn everything a strange greenish-blue color. 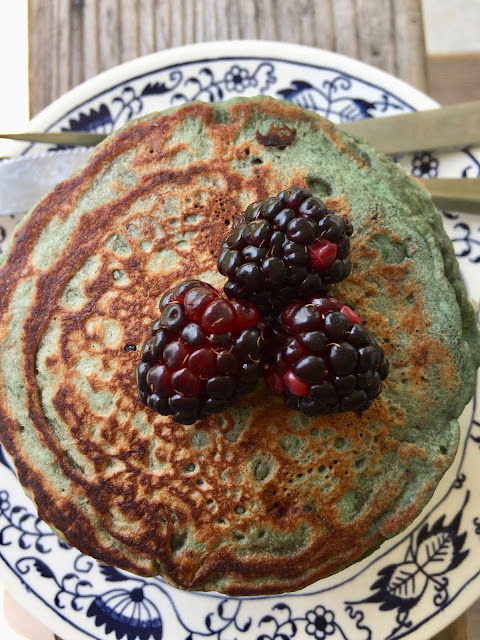 It's not the color I was expecting of these pancakes, but they still taste good! This recipe will serve about 4 people. In a medium bowl, whisk together the flour through cinnamon. In a large bowl, whisk together the sweet potato, 1 cup milk, lemon juice, eggs, olive oil, vanilla, and brown sugar until well combined. Stir the dry ingredients into the wet until just combined. Fold in the blackberries. If the batter is too thick, slowly add more milk until it is pourable. Heat a griddle pan or large cast iron skillet. Coat with butter or oil. Use about 1/4 cup batter for each pancake. Flip when they are starting to bubble and are golden. Cook until the second side is golden and continue until all batter is used. Serve with more blackberries, if desired, and a good drizzle of maple syrup. We also sometimes use plain or vanilla yogurt to dollop on top. So very fluffy and yummy! Love the combo of flavours too, Amy. What interesting pancakes! 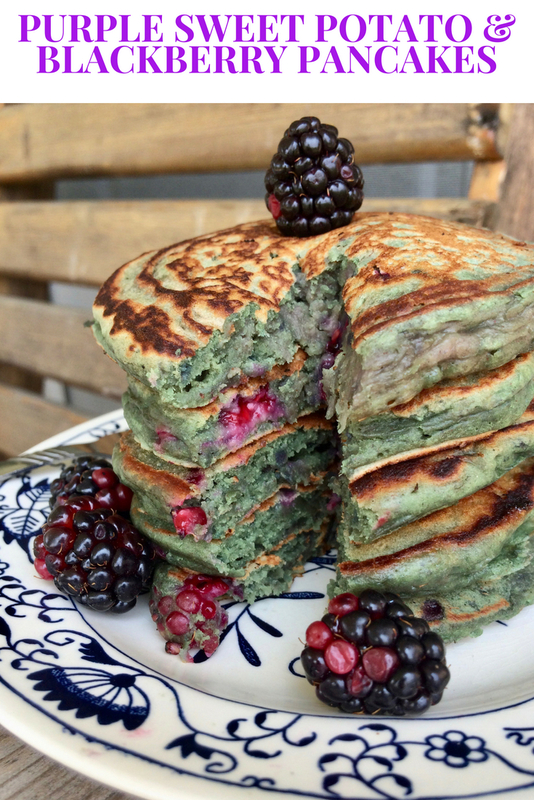 I've never had either sweet potato (purple or otherwise) or blackberries in pancakes. Love the idea, though. These look good -- thanks. Oh YUM!!! What a fun color. Bet the kids loved these! You incorporated two of my all time favorite ingredients into these pancakes. Major yum! what a cool color! purple anything is automatically appealing to me but i've never tried (or even seen!) a purple sweet potato! delicious way to use it. These look like a pretty birthday cake! I can't help but think these would appeal to most kids, who doesn't like fun colored pancakes? I love the flavor combo, purple sweet potatoes are fun to play with. Thanks so much for link to my First Monday Favorites. It's been a long time since I've made pancakes...not sure why I don't make them more often. These sound delightful!